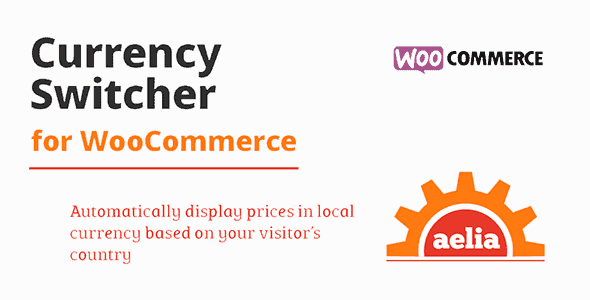 Сurrency Switcher for WooCommerce from Aelia developers allows your shop to display prices and accept payments in multiple currencies. This will grant your visitors the possibility of shopping in their favorite currency, eliminating the costs associated with Credit Card currency conversions. Once enabled, the Currency Switcher will allow you to configure a list of the currencies you would like to accept. Such currencies will then appear in a list, displayed as a widget, which your Users can use to choose their preferred currency. When a customer selects a currency, the shop will be both displaying prices and completing transactions in the new currency. That is, the prices displayed on the shop will be the ones that the customer will pay upon completing the order. This feature will enable your shop to receive payments in different currencies, thus reducing the costs deriving from currency conversions performed by the various Payment Gateways. Also, Credit Card operators often charge a conversion fee when a payment is made in a currency different from the one for which the card was issued. This adds an extra cost on every purchase, and it can discourage prospective customers. Giving your Visitors the possibility of paying in their currency can help improving conversion. Allows to set a base currency for each product, and calculate prices in other currencies automatically(simple and variable products only. This feature requires WooCommerce 2.3 to work on variable products). Allows to automatically select a currency based on customers’ billing country, rather than letting them choose it explicitly. Comes with free integrations with some of the most popular WooThemes plugins, such as Subscriptions, Product Add-ons, Bundles, etc.